If evil aliens suddenly invaded Earth, we would likely as a species, forget our differences and unite behind the common goal of defending our planet and fellow human beings. It would highlight the fact that we are all on the same side. It would highlight the fact that we are stronger and more powerful when we work together. We’d be much more tolerant of others. We’d be grateful just to be alive. Trivial things wouldn’t bother us quite so much. Sometimes I wonder why we have to wait for something so ridiculous and unlikely to happen in order to respect each other, our lives, and the planet on which we reside. 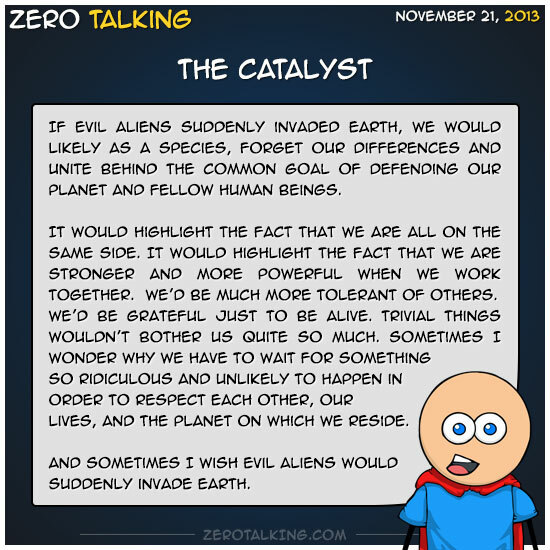 And sometimes I wish evil aliens would suddenly invade Earth.